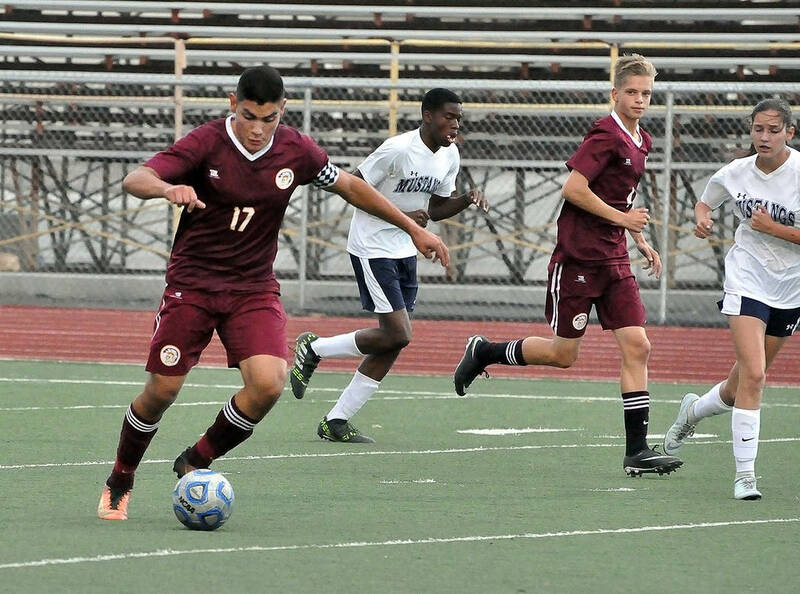 Pahrump Valley’s boys soccer team boasts an undefeated home record. But that gaudy 6-0-1 mark on the smooth artificial surface of Trojan Field doesn’t mean much after a long bus trip. Horace Langford Jr./Pahrump Valley Times Junior forward Fernando Martinez-Fontana scored both goals Tuesday during a 4-2 road loss to Mojave. Horace Langford Jr./Pahrump Valley Times Senior forward Alvaro Garcia works the ball up the field during a 10-0 win over The Meadows on Oct. 3 in Pahrump. Horace Langford Jr./Pahrump Valley Times Senior Jose Chavez is the Pahrump Valley boys soccer team's leading scorer, tallying 24 goals and 10 assists for 58 points for the 9-6-1 Trojans. This time it was Mojave, a team the Trojans defeated 2-1 Sept. 6 in Pahrump, playing unfriendly host, posting a 4-2 win over the Trojans on Tuesday. The game was fairly even before a tough goal just three minutes before halftime gave the Rattlers a 2-1 lead. Off of a quick throw-in, senior midfielder Anibal Ponce sent a long left-footed drive from 35 yards out toward the goal. It bounced a few feet in front of Trojans keeper Ian Kingsley, who seemed caught off-guard as the ball bounded into the net. It wasn’t the only strange goal of the game. Oscar Gonzalez scored the first of his three goals by firing a rocket from Kingsley’s left that deflected off his body and into the net for a 1-0 Mojave lead. Fernando Martinez-Fontana tied it five minutes later on a header with an assist from Abraham Alvarez, and the game stayed tied until Ponce’s tally. The Trojans (9-6-1, 4-3 Sunset) scored on a pretty play 10 minutes into the second half to even the score. Jose Chavez made a strong run up the middle of the field, then found Christopher Vega racing forward to his left. 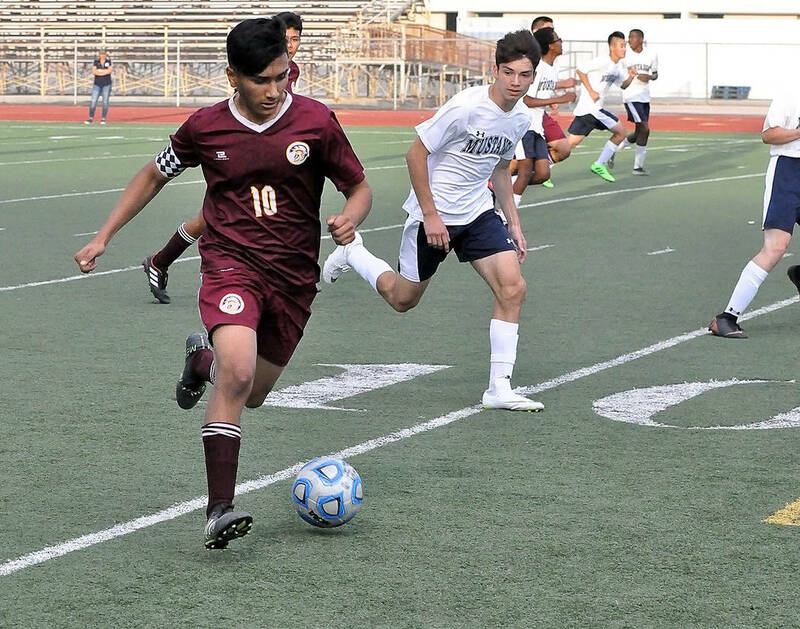 He sent a perfect pass to Vega, who in turn sent a perfect cross to Martinez-Fontana, who sent a low line drive past Mojave keeper Gabriel Sida. 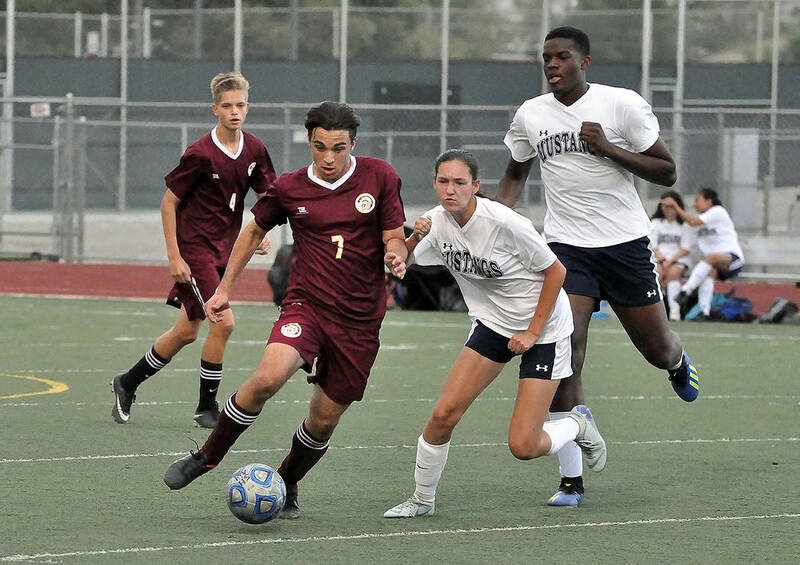 Martinez-Fontana now has 11 goals this season, trailing only Chavez’s 24 among the Trojans. After that, the Trojans had difficulty generating a sustained attack going into the sun and the wind. Five minutes after the tying goal, Mojave (8-2, 6-1) seized the lead on another long goal, this time off the foot of Gonzalez, who sent a shot off of Kingsley’s fingers and into the net. He completed the hat trick four minutes later on a low line drive. Against the wind and the sun, and missing two starters, the Trojans were basically done. “We had two guys who were unable to play in the midfield,” Roberts said. “Could it have made a difference? Sure, but at the same time you’ve got to play with the players you have and make it happen. Roberts said a win Tuesday would have forged a three-way tie in the Class 3A Sunset League between Pahrump Valley, Mojave and Western. The loss dropped the Trojans into a tie for third with Del Sol.